The Government issued a consultation proposal on the 20th September. It contains a number of differing ideas about how the Domestic Renewable Heat Incentive Tariffs will be calculated. The government intend to introduce domestic tariffs next summer. The Non Domestic Renewable Heat Incentive has been running since last November and thousands of Premium Payments have already been made for domestic installations. It seems most likely that the scheme will pay out for 7 years at high rates for every kilowatt hour of heat generated by a domestic heatpump. The tariff rate has been calculated to be between 12.5pence and 20.3pence per kilowatt hour, but the indication is that the plan is not to exceed 17.3pence per kilowatt hour which is the perceived cost of off shore wind power. Logistics indicate that the heat produced will not generally be metered, but will be calculated by the installer on a deemed basis, dependent upon the house type, construction and location. There may however be an opportunity for home owners with very efficient systems to receive higher tariffs if they agree to the efficiency of their system being metered and monitored. A condition of eligibility will be that the house is insulated, but only to economic levels, and there will be loans available through the Green Deal to finance the required insulation. New homes and major renovations will be eligible for Renewable Heat Incentive Tariff payments provided they satisfy the insulation requirements of the current building regulations, but the tariff may be lower than for existing properties. Systems larger than 45 kilowatts are excluded. It is possible that solar thermal heating can be added to ground source heating with both systems attracting Renewable Heat Incentive Tariff payments. Consultations continue until 12th December 2012. The Domestic Renewable Heat Incentive Policy will be published on 13th March 2013 and the Domestic Renewable Heat Incentive Scheme is proposed to be launched in Summer 2013. At Earthtest Energy, we expect the tariffs to be at or close to 17.3 pence per kilowatt hour, with possible increases for efficient systems such as those we install. We expect the scheme to payout over a seven year period. For a typical existing 4 bedroom house we would expect to install a 12kilowatt heatpump and for this to earn £5,000 per year that is £35,000 plus inflation over the seven year payment period. 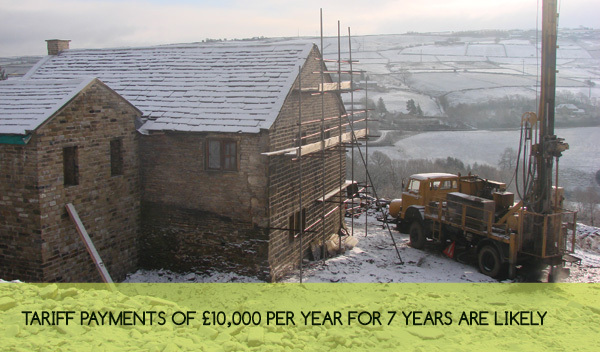 For an older 4 bedroom house particularly in a rural setting, we would expect to install a 24 kilowatt heatpump, and for this to earn £10,000 per year that is £70,000 plus inflation over the seven year payment period. Larger houses with indoor swimming pools would need a 45kilowatt system and could expect to earn £24,000 per year that is £170,000 plus inflation over the seven year payment period. For new houses our crystal ball fails us. Certainly they will be lower than the above figures. Partly because they require less heating, partly because installing from scratch in a new build is cheaper and the government might therefore reduce trariffs for new builds, but also because the government may plan to use the stick as well as the carrot, and use planning conditions to encourage the introduction of renewable heating. Never the less it is likely at least in the short term that the deal will very attractive. Of necessity these predictions are generalised. Send us details of your house and your post code and we will let you have not only our best guess of the Domestic Renewable Heat Incentive Tariffs you may receive, but also a fully costed proposal for your home. The government proposal includes large sections on how payments to later applicants may be lower than the payments made to those who enter the scheme in the initial stages. However they make it clear that once home owners qualifiy, their payments will not be reduced. The government sees this scheme as a key part of their strategy to reduce carbon emissions, so we expect the payments to be generous, but they may not last. Buy early to avoid disappointment! At Earthtest Energy we are available to assist to make the right decisions. And see our other literature to understand the efficiency saving which will not only accrue during the first seven years of use, but will continue for the life of the heatpump and beyond. * These figures are based upon the assumption that a correctly sized heatpump serving domestic heating and domestic hot water will run for 2400 hours per year. If a swimming pool is installed this will be heated even during the summer so the running times of the heatpump are extended. Earthtest Energy secured the first ever Renewable Heat Incentive Accreditation from Ofgem. 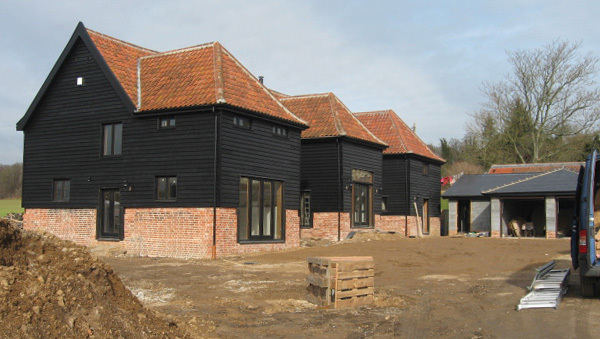 Earthtest Energy installed a Ground Source Heat Pump system to heat an office conversion. The owner will earn 4.5p for every kilowatt hour of heat generated, continuing for 20 years and increasing with inflation.